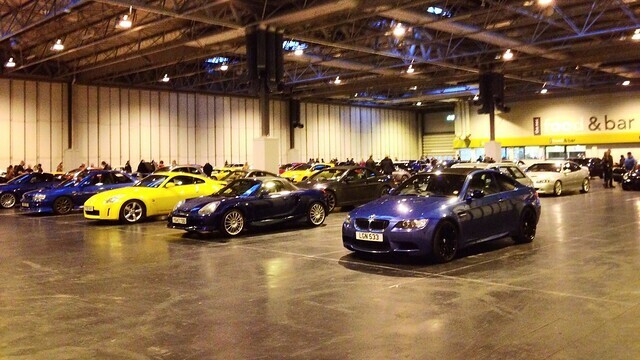 As a petrolhead I enjoy going to motorsport events, often taking my camera, this is where I blog about them. 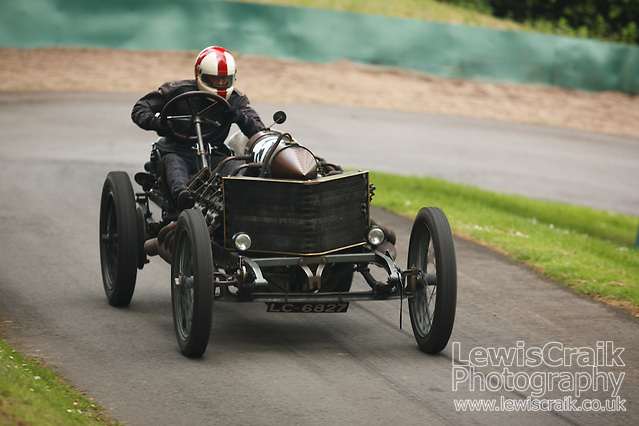 Last month Jen and I met my parents at Prescott Hillclimb in Gloucestershire for the “La Vie En Bleu” French themed hillclimb event. As Prescott is owned by the Bugatti Owners Club, I was expecting a mixture of Bugattis and French hot hatches, but there was a good mix of cars, from Morgan 3 wheelers to Aston Martins. Of course there were plenty of Renault 5s too! However my favourite cars of the day were the Lorraine Dietrich and the Darracq pictured above. The Darracq particularly caught my attention as it had a 25l engine and no body work, not even a floor – the flywheel was spinning inches from the drivers foot. I later discovered that this particular car held the land speed record in 1905! 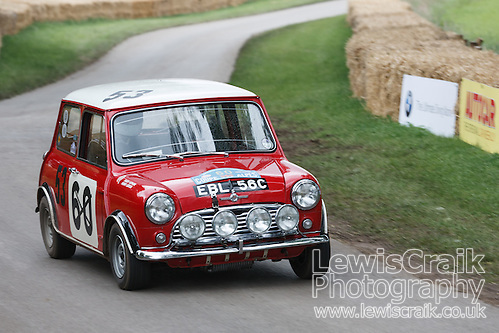 It also set the second fastest time in class and sounded awesome. I’m glad that this 110 year old car is still being driven as intended and not locked away in a museum somewhere. Finally, on the third year of meaning to go, I managed to keep the weekend free and made it to the Rally of the Midlands. Having grown up in the McRae/Burns era rallying is probably my favourite form of motorsport, so it’s a bit rubbish that I haven’t been to many rallies. I’d decided to go to the Merevale Hall stage, as the only other Saturday stage open to the public was at Mallory Park and I’ve shot there before, upon arriving at the stage the first thing that struck me, as someone who has spent a lot of time at race circuits, was the lack of barriers, although there were some in the main spectator areas, most of the time the only thing between spectators and cars was common sense! 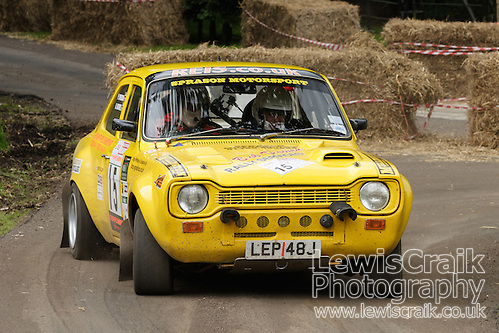 The stage was run twice, once in each direction, my favourite angle was from the afternoon run, where a hay bale chicane had been placed infront of the main door to the hall, the gravelly surface allowed the cars break traction and the cars were running towards me, perfect! I was discussing panning motorsport shots with a colleague, which reminded me of this photo which I took at Snetterton a few years ago, before they changed the layout. The Esses is one of the few corners on UK tracks where you are allowed to be positioned quite close to the apex, close enough to be using a wide angle lens anyway. I’d previously shown an image taken slightly tighter, on the blog post for the Ma5da Racing meeting at Snetterton, but I’ve always liked this one more. It breaks a few rules for instance the car has got more space behind than in front, but rules are merely guidelines and I think it works. 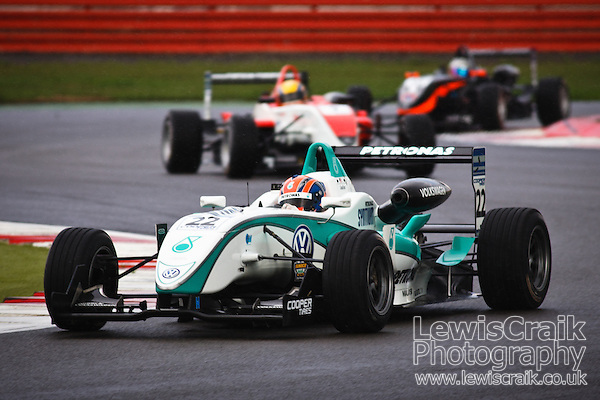 The full Ma5da Racing Snetterton 2010 gallery is available in my archive. I was looking through my email the other day and found that I’d sent this image to someone – I didn’t even remember taking it! As soon as I saw it I knew why I’d emailed it, the brightly coloured cars with the gloomy light (it looks like it was raining) and the, rare for Silverstone, clean background. I was covering Ma5da Racing, which was one of the supporting series at the British Formula 3/British GT meeting at Silverstone in August 2010, so other than this and the Ma5da Racing images (available in my archive) I hadn’t processed any extra shots. The driver is Jazeman Jaafar (Malaysia) driving for Carlin. Browsing around Flickr I came across quite a few light trail images, which reminded me of a few images I took at Silverstone, when Ma5da Racing were supporting the Silverstone 500 in 2009, this one is my favourite. Silverstone Light Trails, a photo by Lewis Craik on Flickr. The qualifying sessions for the second round of the Ma5da Racing 2010 season (and first round of the 2010 MX5 Cup), which had been delayed from the previous day were held under grey, but dry, Norfolk skies, on what had been touted as the warmest day of the year so far. The two sessions for the Ma5da Racing Championship went first and passed without any major incident, at least from where I was standing at The Esses. This corner gave me the chance to get out my wide angle lens, which I rarely get to use for motorsports, but usually gives some great images. I stayed at The Esses for the MX5 Cup practice session which was my first chance to see multiple mk3 MX5 race cars on the track at the same time, again the session went without too much trouble, until Kevin Dengate had a moment on the second of the esses and left a lot of dirt on the track. Paul Sheard eneded the session fastest, so took the MX5 pole for both races. On my way back from The Esses, the heavens opened, luckily I was able to duck into the Rob Boston Racing awning to avoid the worst of te downpour, but for the drivers in the first Ma5da Race of the day the damage had been done, the track was very wet and with all of the drivers having qualified in the dry the first corner was somewhat chaotic. Rob Boston managed to get a good start and left all the chaos behind him allowing him to pull out a big lead (4s) which he kept until the chequered flag. Next up was the MX5 Cup race, the first race for the mk3 MX-5 race cars, the track had dried off a bit for this race, although the skies were still grey. The mk3 part of the race was won by Paul Sheard, again by about 4s. As there were only 5 mk3 cars the numbers were made up with a few mk1s, and it was good to see Nick Gilfillan winning the mk1 part of the race. I stayed Russell Chicane for the next of the Ma5da Racing Championship races, which was a close battle between Tom Roche and newcomer Phil House (although he was in one of the Rob Boston Racing cars), Phil did lead most of the race, but Tom managed to overtake near the end of the race. Seeing as I’ve posted images of Tom Roche leading races, here’s my favourite shot from the race, with Phil leading. By the time the second MX-5 Cup race came round the sun had come out (Yay!!! ), I headed back to The Esses for the race as that was where all the action had been for the previous race. The race went much the same as the first, with Paul Sheard leading, although Kevin Middleton was a lot closer this time around. Paul won the race, however Nick Gilfillan wasn’t quite so lucky, after having pulled out a fairly decent lead, he had a big moment right in front of me at The Esses and gifted the lead to Mark Pierpoint. As per the first meeting at Brands Hatch the race of the day, featuring both Tom Roche and Rob Boston had been saved for the last race of the day and the race did not disappoint. Not only were Rob and Tom swapping places ate the front, the battle for 3rd was also very closely contested between Jonathan Greensmith, Phil House and Chris Dawkins (finishing in that order) and there was close racing all the way down the field. Ma5da Racing got their 2010 season off to a great start, with 62 cars and 6 exciting races on a sunny Brands Hatch Indy circuit. The new race day format spliting the drivers into 4 groups, with each race consiting of 2 different groups, there was plety of action and overtaking. Race 1 featured Tom Roche and Jonathan Greensmith’s groups, so we were treated to a classic Roche vs Greensmith battle, as we have seen so often over the 2 years that Ma5da Racing has existed, Tom won this time, but as ever it was a good close race. Further down the field there was plenty of close racing, with a lot of new cars and new drivers. Race 2 I moved round from Druids to Paddock Hill bend and it was only Scott Leach that ended up in the gravel (as usual ending up infront of where I was standing on the previous lap) at the top of the field Rob Boston lead the race, after starting 2nd next to his team mate Dave Connor, and built up a massive, by Ma5da standards, lead of 9s. Charles Plumley was in second place, with new driver Matt Davies (albeit in Steve Greensmith’s old car) had a great debut in 3rd place. For the afternoon I moved round to Clearways, luckily unlike the launch day the sun stayed out and the track stayed dry for an afternoon of close racing. Race 3 was the Blendini Motorsport show, with the green liveried cars of Tom Roche and Charles Plumley leading from start to finish, although Chris Dawkins and Dave Connor were never far behind, but locked in their own battle. Race 4, the last of Saturday’s races, looked like it was going to be a re run of the last race of the 2009 season, with Rob Boston up against Jonathan Greensmith at the front of the field, however, by the time the cars had got round to me, Rob had slipped down the field, but had made it back to second, albeit with a large gap, by the time the safety car came out for an incident at Paddock Hill bend. After the safety car came in Rob was able to overtake Jonathan and stay in front for the rest of the race. Further down the field there was a great 4 way battle for third place with Chris Woodger, Ben Robinson, Mark Pierpoint and Martin Stevinson (finishing in that order). This race Scott Leach made up for putting it in the gravel a lap too late for me, by running over the gravel trap right in front of me, also this time he was able to continue with the race. Race 5 came after two races which had been red flagged on the first lap (the second one also got red flagged on the restart), so there were a lot of people waiting anxiously for the Ma5das to get round the first lap, all in one piece, they managed Paddock Hill Bend and Druids without any problem, but David Neville span off on the exit of Graham Hill Bend/the Cooper Straight, hitting the armco fairly heavily, causing the safety car and then the red flag to be used. Then all track activity had to stop, for the Kent Air Ambulance to pick up a casualty (not related to any of the on track action). With the amount of delays, it was decided to shorten the afternoons 15 minute races to 10 minutes. From the restart it was Jonathan Greensmith who led the pack away and won the race, although Charles Plumley was challenging hard for most the race, even taking the lead from Greensmith up the inside at Clearways, only for Greensmith to win the position back and then Plumley to lose a few more positions with a mistake at Paddock Hill Bend. This promoted Adam Gore, on his first race weekend, to the second step of the podium and the driver of the day award. Race 6 was the one I’d been looking forward to, Tom Roche and Rob Boston each had two wins each from the Saturday and would be going head to head. The first lap passed without too much incident, only Ben Robinson ending up in the gravel trap at Druids, second time round Gary Hufford and Andy Coombs ended up nose to nose right infront of me, but managed to escape and rejoin the pack, which was now behind the safety car, after Martin Tolley and Kevin Taylor collected eachother at Paddock Hill Bend. When the marshalls had cleared up, there was only time for a few laps of the shortened race, which provided an excellent dash to the line, both times Tom and Rob came past me they were side by side, which continued to the finishing line as they were only separated by 1/1000th of a second, with the yellow and black car of Rob Boston just infront. A full gallery of images from the weekends racing can be found on my website. The clocks had only just gone forward for British Summer Time and it was time to get back to Brands Hatch, after what seemed like only a few weeks since the Ma5da Racing Winter trophy 2009. The format for the day was simple, an open pitlane trackday with the championship launch briefing during the lunch break, a good chance to catch up with everyone before the season starts. The track started out damp, but dried out through the morning session. There were lots of new cars on he track, but without race numbers (I’d not been to the pits at this stage) it was hard to see who was in a new car and who was new to the championship. After the championship launch briefing, and a quick look round the pits at who was driving what, it was time to head round to Clearways for the afternoon session, but when I got there, the rain was bucketing down, with only a few cars out on track it was an easy decision to stay in the car until it had died down a bit. The spray made for some interesting pictures as did Rob Boston’s oversteering, luckily Rob has a tinted visor, so I was able to spot him in his new car. My favourite shot of the day however, was when Jonathan Blake was out in the new mk3 race car, set to make it’s debut at Snetterton later this month, I saw the picture on the back of the camera and knew it was the shot of the day.